Now I know apricots can be very grainy, mushy, and well... flavorless. Especially the ones where I live, and even though it's Summer, they never seem to be juicy and fresh tasting. For those of you who are lucky enough to have ripe apricots locally, I'm very jealous. But for those like me, with our mushy tasteless apricots, this recipe is perfect for you! Sauteing the apricots first in coconut sugar and cinnamon brings so much flavor and warmth to the fruit. It's definitely more of a Fall breakfast but honestly, I could eat pumpkin bread or warm apple pie any day of the year. Actually, I crave Fall dishes more in the Summer than I do in the Fall. 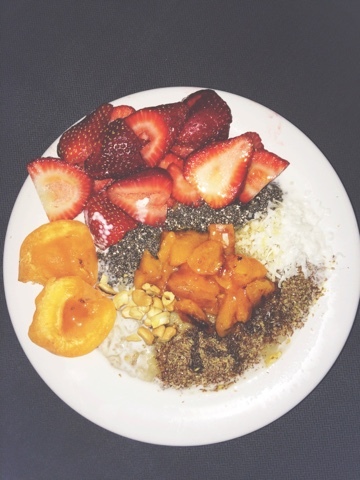 The subtle hints of coconut threaded throughout the oatmeal does create a nice refreshing taste though, and balances out the rich cinnamon-sugariness from the apricots quite nicely. Although, it wouldn't be the first time someone in my family used a sweet extract in a savory meal. I remember a couple of years ago, I came home to my brother hunched over the stove-top making himself some vegetable soup. He started listing everything he put in it, and it actually sounded pretty good. Then he said it. He said he put almond extract in the soup. I almost felt bad laughing because of how excited he was to try it. Let's just say I don't think almond-vegetable soup will be making its debut anytime soon. Not from this house at least. 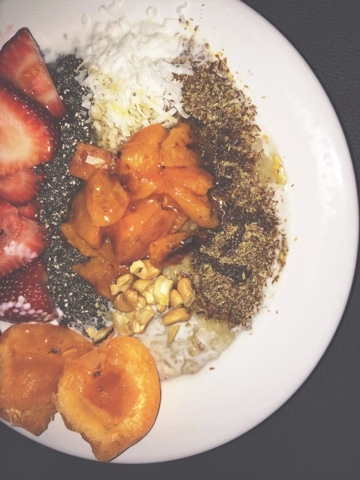 But with the perfect amount, coconut extract brings a tropical, Summery twist to a bowl of warm vanilla oats. Then top it with chilled coconut cream, caramelized apricots, & flaked coconut, and you're all set to inhale your Monday breakfast. Or any day of the week for that matter. I also topped mine with a ton of strawberries, which took away from the presentation, but these strawberries were the best I've ever had so it was a must. Cook oats accordingly using the 6 oz. nut milk & 6 oz. water. Stir in coconut & vanilla extracts and stevia once cooked to the consistency you like. While the oats are cooking, heat a small pan with the coconut oil over medium-low heat and sautee the diced apricot in the cinnamon and coconut sugar until tender and slightly creating a caramel on the bottom of the pan. Assemble: Pour the oats in a bowl. 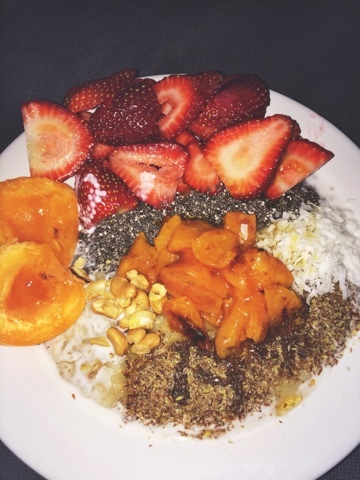 Top with sauteed apricots, chia & flax meal, coconut shreds, cashews, the other halved apricot, and honey. Pour the coconut "cream" around the oats. And if you're like me- fill half the bowl with strawberries.